When Prince drops new material on his website and announces that in less than a month he’ll embark on a nine city tour of intimate venues, you better pay attention, and you better do it fast. Even with tickets priced at $250 for each of the four Seattle shows (two per night), three were sold out before many fans could roll some change and march on down to the box office. (Predictably, the fourth show sold out at the door). An intimate, unforgettable evening was exactly what Prince delivered. The chemistry with his brand new all-female band 3rdEyeGirl is incendiary, reminiscent of the perfect symmetry once found with those other girls (Wendy & Lisa from The Revolution, circa 1983-1986). Seeing Prince’s colossal genius stripped down to a basic setup of two guitars, bass, drums, and occasional keys (by Prince, of course) was a rare treat. The late show Thursday night felt like an invitation to an afterparty where new material, rarities, and some seriously heavy jamming were exactly what Prince felt like serving up. And so he did. Everybody knows that hits fly effortlessly from his fingers (seven Grammy Awards don’t come for free), but underneath the hugely successful commercial hits, Prince should be widely recognized for the fiercely independent artist and bona fide guitar prodigy that he is. At times, the set veered into such heavy, crunchy territory that the sound was deafening in the best possible way- Jimi Hendrix being the only possible reference in terms of sheer innovation and ease. 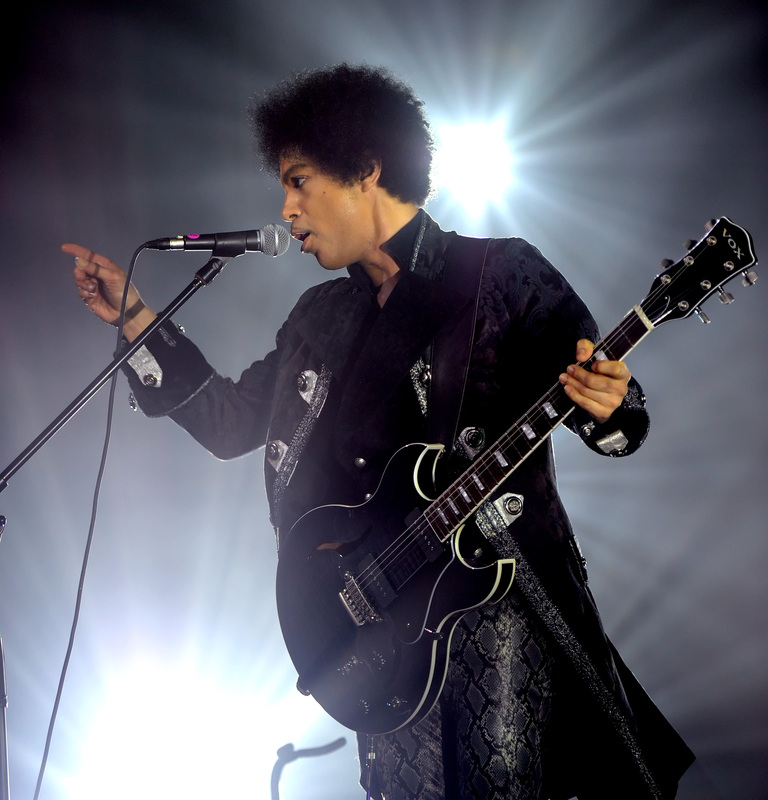 (At 54, Prince looked fighting fit and not unlike Hendrix, sporting a short Afro and a black ruffled shirt). Opening with a reworked, throbbing “Let’s Go Crazy”, the set plowed through a hefty back catalog from which Prince undoubtedly spent time culling the very best rarities, album tracks, and new material to show off with the girls. “Endorphinmachine”, “She’s Always In My Hair”, and “I Like It There” preceded even earlier tracks “When We’re Dancing Close and Slow”, “Bambi” and “Let’s Work” from Controversy. The Sign O’ The Times album was also prevalent with “I Could Never Take the Place of Your Man” and “U Got the Look”. “Ready for some lip-synching? Everybody’s doing it,” Prince teased, as slick new track “Screwdriver” began and the lyric video flashed in bright retro colors on the screen behind him. (Did he really lip-synch? Not a chance.) 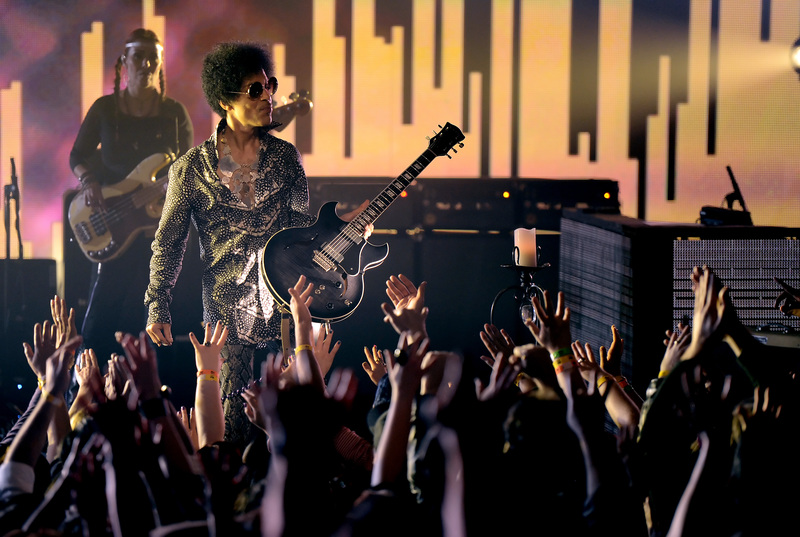 The 3rdEyeGirl material, including “Plectrum Electrum” and “FixUrLifeUp”, is energized and solid. Prince is clearly in the midst of an inspired streak, getting busy in more ways than one, thematically speaking. Making love, falling in love, ladies acting up, a healthy pinch of spirituality- all the themes we’ve come to expect from Prince are present in the new songs. The new material also reveals a dose of wry humor and lyrical barbs, something else Prince is known for. He speaks his mind, though at times it may be in the form of a riddle. The late show Thursday night was rewarded with more off-the cuff surprises than the earlier set. “I said I wasn’t going to do this…but it’s the late show,” Prince relented at encore time, firing off a hit sampler to level all in its path and making the audience lose their minds with “When Doves Cry”, “Hot Thing”, “Nasty Girl”, “Alphabet Street”, “A Love Bizarre”, Darling Nikki”, “Pop Life”, “I Would Die 4 U”, and “Housequake”. The club dates were in many ways the flipside to Prince’s last Seattle-area appearance at the Tacoma Dome in December 2011. Where the Dome show was a satisfying but lightning-quick trip through the hits; the Showbox was more of a slow-burning workout. 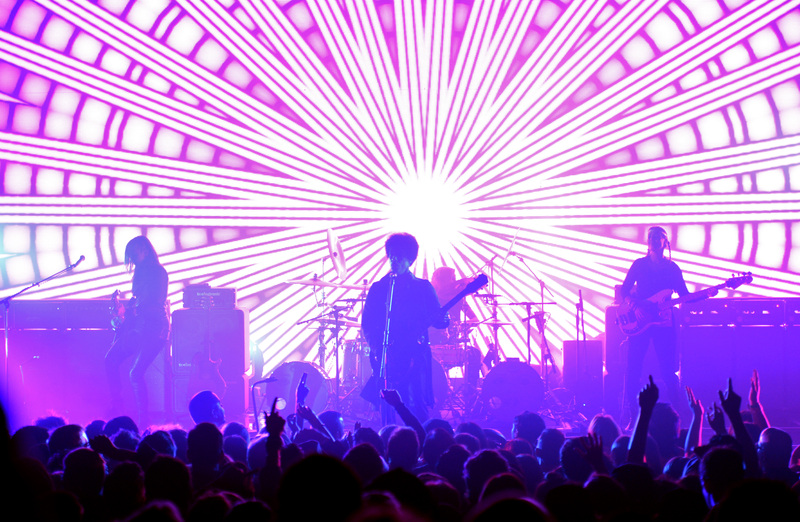 Classics were reinvented and the set plunged deep into Prince’s favorite tracks. Which is really what any fan would want: Prince unleashing his genius exactly how he wants to for a few hours of transcendental music. “We’ve got a lot of hits, we could be here all night,” Prince said. One could only hope. Nick Cave & The Bad Seeds don’t look the part of international chart-toppers with six #1 positions worldwide and an independent album at #29 on The Billboard 200 (Push The Sky Away is their highest ever placing in the U.S.) If you were to cross paths one wouldn’t be faulted for passing on the other side of the street, instinctively suspicious of the strange, neatly suited rogue with jet black hair or the wild, Rasputin-like figure of multi-instrumentalist Warren Ellis at his side. The Bad Seeds have always looked more like apocalyptic preachers than traditional hit makers. The band, led by singer/composer Nick Cave, opted out of popular music’s path of least resistance a long time ago; in fact it’s been that way since their unruly beginning in 1984. Appearing at the completely sold out Paramount Theatre, the most marked change since those days is the band’s social media accessibility and the median age of the fans. Nick Cave in his mid-50s is a more refined figure than he was in younger days, but ‘refined’ is relative when you’re speaking of a man whose string of 15 exceptional albums draw from a deep well of diabolical characters and tales of vengeance, temptation, and wrath. Which isn’t to say he’s one dimensional or lacking in humor: Hannah Montana and Avril Lavigne appear in Nick’s work in ways both menacing and farcical, as if he’s a perversely fascinated wolf spying on pop culture innocents and poised to take a bite. There’s also Nick Cave the romantic, whose deep baritone delivered sincere wonder at the mysteries of love Sunday evening (he’s been married to former British model Susie Bick since 1999). Part of Nick’s uniquely enduring appeal is his ability to build momentum through a rare combination of storytelling and mania, jumping and shaking through a nearly two hour set filled with all manner of dark impulses. Opening with “We No Who U R”, Nick led the current Bad Seeds (six musicians and two backup singers) through songs spanning his entire career with no gimmicks or frills, but plenty of feeling. “From Her To Eternity” – from the Bad Seeds’ 1984 debut- remains a masterpiece nearly 30 years on. Other unexpected surprises were “Jack The Ripper”, “Deanna”, “The Weeping Song” and epic death row tale “The Mercy Seat”. 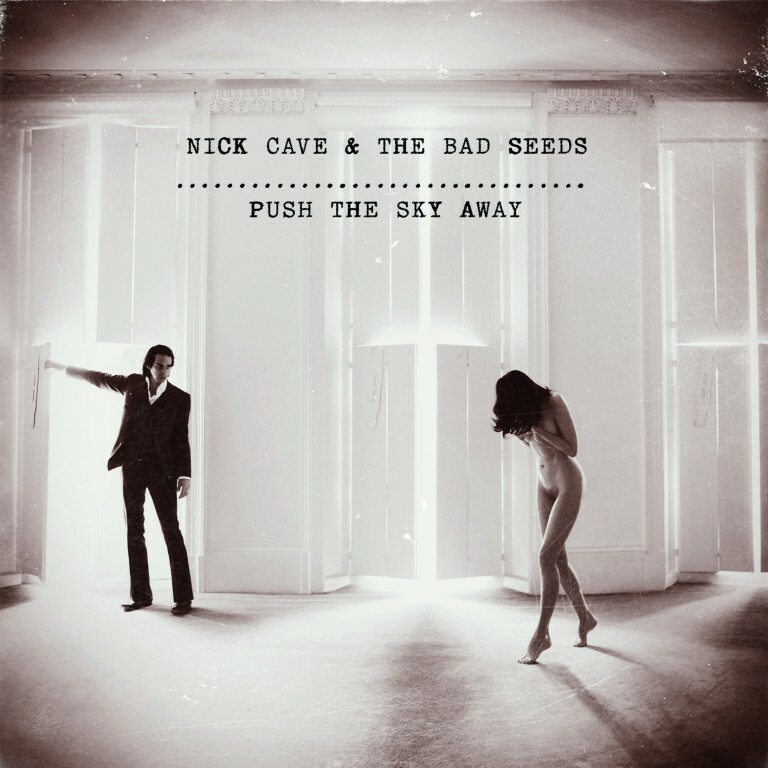 Push the Sky Away figured largely into the set; understated songs such as “Jubilee Street” swelling to a stunning crescendo with dual drummers and textured arrangements. The album’s sparse moments were elevated to the most ferocious, the two smartly-dressed backup girls barely able to flail their arms in time with the music. “Red Right Hand” was given extra muscle with layers of percussion. “Wide Lovely Eyes” and a trio of songs accompanied by piano brought the mood into quieter territory (albeit only momentarily) with “Love Letter”, “And No More Shall We Part”, and “People Ain’t No Good”. A sinister, somewhat campy rendering of “Stagger Lee” ended the main set, with the band momentarily returning for 1985’s “Tupelo” and the haunting atmospherics of title track “Push The Sky Away”. When religious picketers perch outside the gates of any concert, it’s a sure sign of a spectacularly good time. Lady Gaga kicked off the first US date of her Born This Way Ball at the Tacoma Dome with much fanfare, including the official launch of the Born Brave bus. The interactive outreach vehicle is bedecked with fan-generated artwork and aimed at connecting youth with local resources for issues ranging from mental health to bullying. (Gaga herself surprised fans by appearing for a personal viewing of the bus, leading an informal champagne toast several hours before the show). Yet despite the good works of Gaga and her mother Cynthia Germanotta (who jointly run the Born This Way Foundation), the handful of protestors loudly voiced homophobic comments and opposition, however futile. “What you are about to do is called ‘idol worship’…” shouted one young zealot, a warning gleefully met with laughter and a sea of emphatic ‘amens’ from fans. Dressed to the nines- everyone from seven year olds with good-natured parents, shivering teenagers emulating Gaga’s most risqué outfits, gay couple of all ages, and curious bystanders- were ready to have the time of their lives inside the Dome. And so they did, come hellfire or not. The Born This Way Ball, a more tightly executed and presumably bigger budget affair than 2009-2011’s The Monster Ball, was a nonstop feast for the eyes, delivering all the outrageous sets and Thierry Mugler-like eeriness one could hope for in two and half hours. Over a dozen fantastical costume changes- the kind of showstoppers we’ve come to expect from Gaga- caused jaws to drop repeatedly and confirmed that Gaga, who turns 27 in March, is in great shape and refreshed after a month off for the holidays (the tour began last April in Korea, continuing through March in the US). Beginning with Gaga’s emergence in futuristic battle gear astride a black unicorn that walked the stage’s fortress and around the catwalks, one outlandish ensemble materialized after another. Horned masks with three faces, alien-like headpieces, a more “practical” version of the meat dress (not to mention a meat sofa and human-size meat grinders), and a hot pink origami dress reminiscent of John Galliano’s 2007 Dior collection all made appearances, as did all manner of silicon, latex, and leather. Album cover imagery came to life as Gaga transformed into a motorcycle creature during “Heavy Metal Lover” and cruised along the stage’s catwalks. Despite her bombastic image and constant antics, at this point one would have to be completely in denial to discredit Gaga’s penchant for hit songs coupled with natural vocal strength. Anyone that’s seen her incessant tour itinerary must recognize how hard she works, and part of the reason we’re fascinated with Gaga in the first place is her calculated insanity. The Born This Way Ball crystallizes the crazy message she’s been trying to worm into our consciousness the last five years. It remains to be seen if literally catering to kids in songs like “Hair”, “Bad Kids”, and her stage banter will evolve with next release ARTPOP and resonate with older fans- or let’s face it, ones closer to her own age. (It’s hard to convincingly sing about high school at 27, unless perhaps you’re watching Grease). A tongue-in-cheek comment by Gaga herself at one point about the show “not being for children” raised the question of whom exactly her audience is these days. It seems to be a pretty varied bunch of monsters, most of them young, but many old enough to know a ridiculously good time when they see one and “Just Dance”.